You’re a smart business owner. You keep up to date on the latest trends. You really like the whole customer feedback idea and maybe you’ve heard about Net Promoter but you’re just too small for it to be useful, aren’t you? Maybe you think that as a B2B company you don’t have enough customers to make the data collection useful. Don’t be so sure. Customer feedback of all types and NPS in particular can be used to good effect in businesses of all sizes, including small and medium B2B businesses. Here are your 4 steps to customer feedback success for small or medium B2B organizations. The heading sounds very new age but the truth is that in a small business you are much more likely to know personally and have interacted substantially with a good proportion of your customers. So the feedback will feel much more personal. That’s all well and fine for positive feedback but if you want honest feedback, some of it is not going to be pretty. When a customer provides negative feedback about your business the natural reaction will be to dismiss it. 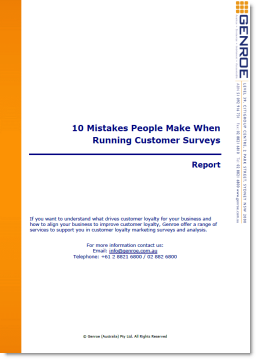 You will tell yourself that the customer is wrong (can a customer be wrong in their opinion? ), they don’t understand, it was only a specific problem on one project, they are just a grumpy customer, etc. Accepting feedback that is negative hurts but if you dismiss it you will be the one that is wrong. So, before the first survey is sent or the first phone call made, prepare yourself and start with an open mind. The first task is to decide what and how you will listen to your clients. Keep the survey as short as possible. It keeps response rates high and client annoyance low. Give yourself a limit of maybe 5 or 10 questions and stick to it. That will force you to prioritise what is important. Aside: Some Net Promoter ® proponents suggest just two questions: The “would recommend” question and an open text question. When you have large volumes of customer feedback this approach is very effective. However, when you are only surveying a few customers this approach has problems trying to identify the underlying issues. So you should ask a few more service attribute questions to help you determine what needs to be done. As Joe Friday of Dragnet was famous for saying you want “Just the facts ma’am”. Don’t drop in few sales slanted questions: what is your budget next year, how many widgets do you need, etc. To customers that’s changes the survey to “Oh the survey was just an excuse to sell to me.” Response rates will drop and so will trust. Our favourite is the Net Promoter question but you could also use customer satisfaction. Some people worry that the NPS requires a large sample size to be statistically significant and that is technically correct. However, you are really just looking to a good indicator of customer loyalty for the specific respondent and for that NPS is arguably the best. My advice is not to get too hung up on the statistical analysis. Use the approach to get feedback from your clients through a standard survey process and action it. Just taking this step will put you ahead of most organisations. These are critical questions as they will tell you what and how you need to change to improve. Just don’t add in too many (2 or 3 is enough) as they make the survey more complex for the respondent. There are lots of ways to listen but these days only two are really worthwhile: internet surveys and telephone interviews. Have a third party (can be a contract interviewer) call key client staff at the end of an engagement with your short survey. For long term clients maybe do it every 6 months, rotating clients so you don’t over survey them. Make sure that you don’t call them yourself (or have one of your staff do the call). Customers have a much harder time telling you the truth in person (well over the phone) and you want to make it easy for them. These interviews are relatively expensive you probably want to limited them to key customers. There are lots and lots of internet survey platforms out there and they are a good way to get feedback from lager numbers of clients at a low cost. You can use this channel to collect feedback from a large number of individuals. Again you can survey people at the end of a key engagement but you can also use them to collect information from customers who might have been through a one-off workshop or other important element of the engagement. So now you know what your customers think. It’s time to start taking action. Review your feedback and determine how and what to change in your business to improve your performance. It may not be immediately clear what needs to be done so consider contacting customers who provided negative feedback for follow-up details. The changes don’t have to be enormous but they do need to occur. If you don’t make any changes to your business you have just wasted all the time and effort expended in collecting the information. You have also wasted your customers’ time. Not a nice thing to do. 4. Let Your customers Know You have Heard them. The survey is done, the results are counted, you’ve taken some action; time to relax. Not so fast. The last thing you need to do is go back to your clients and let them know you heard them. After all they invested time and effort to provide the feedback. The least you can do is telling them what you have done with it. Don’t over think this step. It can be as simple an en email to everyone who responded with some high level findings from the feedback and telling them how you are changing based on it. Great article! Start listening to customers and learn from what they are telling you….it takes the guess work out of providing a great customer experience. As a certified Net Promoter Associate, I have to admit that I am also fond of including a Level of Effort question in surveys –asking customers to gauge their ‘level of effort’ in interacting with your company can provide valuable insights. I quite like the idea of Customer Effort but I have always found it difficult to use in driver analysis so the practical uses are not as good as I’d like. I don’t have any suggestions and have had the same issue, however, I keep my eyes out for new trends in how to use a level of effort metric. Hoping someone out there figures it out and shares with the rest of us!! I’m both happy and sad that you have had the same issue with CES. Happy that I didn’t miss something. Sad that it can’t be made more useful.